The Limit Indicator might be of interest to some. 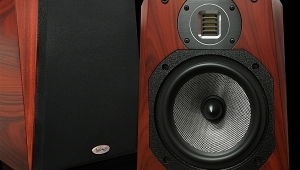 Given the relatively small size of the Three's drivers and enclosure and the potency of its multiple amplifiers, it can be assumed that some users might run them at damaging levels. The designer, Bruno Putzeys, has implemented limiters based on multiple-intelligent-detection algorithms that predict when the incoming signal would be harmful to drivers or amps. He thinks it is "the most unintrusive limiter ever used in a playback device." I agree. In fact, I never turned on the Limit Indicator, because I didn't want that cue to bias my subjective assessment. At no point was I aware of the limiter's operation. "The average output in digital recordings varies between 4dB for a lot of modern pop and rock and 20dB for some audiophile recordings, especially classical. What other high-end systems do is simply put in so much gain that you can play quiet recordings ridiculously loud but the risk of what happens when they forget to take the volume down when playing something else is borne completely by the user! I don't find that an acceptable solution. So I set the input sensitivity such that a maximally loud signal replayed at 100 is the loudest the speaker can do (allowing excursion limitation for sub frequencies, of course). 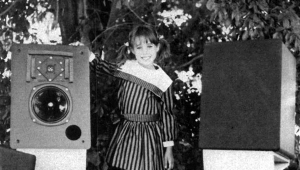 Normally speaking, good recordings will be mastered such that at least the loudest passage will actually hit full scale, give or take, which means that 100 is still as loud as the speaker will go and that ought to be plenty." It was plentyonce I stopped trying to find the Kii Threes' limits and just paid attention to the music they made. With the Kii Control connected to the Baetis Prodigy X music server via S/PDIF and USB, I was able to do a little fine-tuning while sitting comfortably in my normal listening seat. I settled on a minimal attenuation with the >3kHz shelf filter, which removed a slight glint from the top end. My visual bias goaded me into bumping up the bass ever so slightly from 300Hz down, but ultimately I rejected that and left the bass set flat. 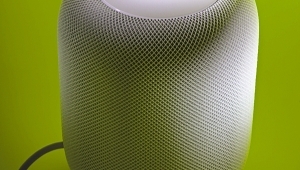 Now I'll try to disregard all the above and deal with these unusual speakers as if I know nothing about their underlying technology. Let's first dispense with issues of bass. I've long prized a recording of Mendelssohn's Organ Sonatas, performed by Thomas Murray on the E. & G.G. Hook instrument in the sanctuary of the First Religious Society, in Jamaica Plain, Massachusetts (CD, Raven OAR-390). The fourth movement of the Sonata in F is my go-to for low-frequency articulation and extension. You may be incredulous to hearI wasthat the Kii was entirely satisfying in delineating the descending pedal notes. In fact, I found the Kii's ability to convey the sensation of a single throbbing column of air rather than a seemingly louder but more diffuse and indiscriminant growl to be almost unique. 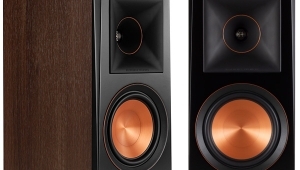 It was the kind of performance not ordinarily possible in a typical listening room, and for which one usually turns to a well-placed, well-equalized subwoofer. But that was more of a party trick compared to listening to the more usual instruments, voices, and ensembles on which the bulk of musical enjoyment is built. For reasons that now escape me, I played "It's Now or Never," from Elvis Presley's 24 Karat Hits! (SACD/CD, RCA Living Stereo/Analogue Productions CAPP 2040 SA). After I'd savored the broad but somewhat foreshortened soundstage of the intro, Elvis's entry startled me with its presence. Sibilants were sufficient and natural, and I felt in the presence of the warmth of his open voice. Even more than Elvis (! ), baritone Matthias Goerne appeared in almost spooky verisimilitude from a recording of early Mahler songs orchestrated by Luciano Berio, accompanied by Josep Pons and the BBC Symphony (SACD/CD, Harmonia Mundi HMC 902180). I've been familiar with Goerne's voice a long time, and it has warmed and deepened over the years. Now he seemed to be in my room, about 4' farther from me than the Kii Threes, the orchestra behind him and extending back from there. Also on this disc is a good performance of Berio's Sinfonia for Eight Voices and Orchestra, whose complexity is almost surgically revealed. For drama, however, I'll stick with the recording by Peter Eötvös leading the London Voices and the Gothenburg Symphony (CD, Deutsche Grammophon 0289 477 5380 3). They come at the listener with Schwung and range, and were even more engaging through the Kii Threes. I had similar responses to John Hammond's Rough & Tough (SACD/CD, Chesky SACD346), and Christina Pluhar and L'Arpeggiata's La Tarantella: Antidotum Tarantulae (SACD/CD, Alpha SA503). I chose them because they lack any center-channel solo/voice content, and playing them in stereo should affect only soundstage depth and spread. The Chesky is a 4.0-channel recording; in two-channel with the Kiis, Hammond's voice had added bite. La Tarantella is 5.0-channel, but the center channel carries only ambience. In two-channel stereo with the Kii Threes, the interplay of voices and instruments was disarmingly natural, with complexity and depth. 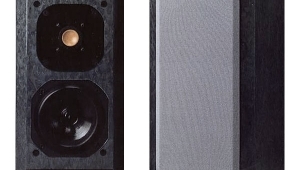 With either recording, the soundstage lacked only the widely lateral contribution that would come from having rear speakers. Returning from Seurat's Circus Sideshow, a recent exhibit at the Metropolitan Museum of Art that included artworks preceding, inspired by, and otherwise related to Seurat's 188788 masterpiece, Parade de cirque, I was inspired to listen to Satie's 1917 ballet score, Parade. My choice was the recording by Antál Dorati and the London Symphony (CD, Mercury Living Presence 434 335-2). I'd listened to this track once before, but through the Kii Threes the performance and sound were simply stunning, and lived up to my vague but happy memories of the 1967 LP (Mercury Living Presence SR90435). Strikingly revealed were the intricate wind and string scoring, interspersed with outbursts from the brass and spiced up with a typewriter! But could the Kii Three deal with the really big stuff? Yes, the Threes proved perfect for impressing my friends with Rimsky-Korsakov's Dance of the Tumblers, in the recording by Eiji Oue and the Minnesota Orchestra (SACD/CD, Reference RR-71SACD). The dynamic range was huge, the explosions of brass and percussion had almost palpable impact, and the soundstage was spacious. Did you notice that almost? I chose the word not to imply a limitation, but to acknowledge that many listeners will not have heard this recording of a bass drum without a room boom that conveys the physical impact while blurring the sound. Through the Threes, it sounded like a real bass drum. 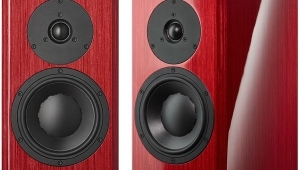 Comparing the Kii Three to non-DSP speakers is difficultthe latter are co-opted by their rooms and placements, to say nothing of the possibility of external DSP. 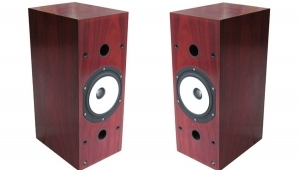 Ignoring all that, the Kii Threes were competitive with any speaker I've heard in my listening room. 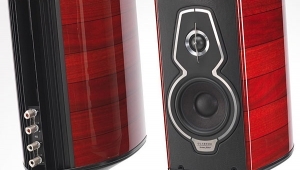 They produced a bigger soundstage and more midrange transparency than Focal's Sopra No3s, though the latter offered greater harmonic weight and more center-stage focus. 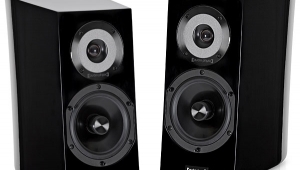 If I use Dirac Live equalization to correct my room's sound, my current reference speakers, the Bowers & Wilkins Diamond 802 D3s, don't sound much different from the Kii Threes, but the correction makes for a smaller sweet spot with the B&Ws. 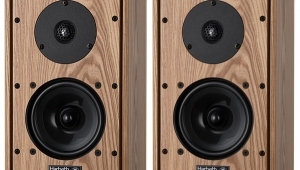 Without EQ, the 802 D3s are a little brighter in the highs and, in the upper bass, have just a bit of warmth due to placement and room acoustics. The audible effect of a Dirac Live calibration with the Kii Threes was inconsequential. 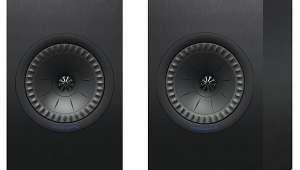 In a way, the only valid comparison was with B&O's BeoLab 90, a much larger, much more expensive ($84,990/pair) powered speaker with DSP that is theoretically capable of much greater output levels than the Kii Three. However, in my room (see below), the Threes didn't lack for SPLs, and were certainly easier to set up and live with. 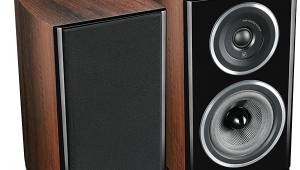 A pair of Kii Threes, the Kii Control, and a truly high-quality serversuch as the Baetis Prodigy X running JRiver Media Center or Roonwould constitute an almost perfect audio system with a minimal room presence. I haven't gone that route because the Kiis aren't yet easy to integrate into a multichannel system: You can feed them individual analog signals, but not multichannel, high-resolution digital. In addition, the 90ms latency of the optimal Exact setting makes it hard to integrate them with other, more conventional speakers. All of this may changethe Kii contains a WISA interface that is inherently compatible with hi-rez, wireless multichannel communications. 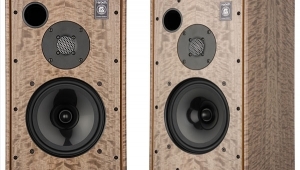 But the Kii Three could never be my reference loudspeaker. 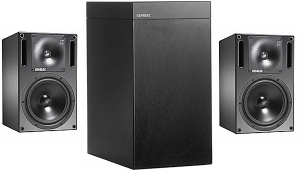 I couldn't assess separatesspeakers, amplifiers, processorsif my reference speakers already included all of those components. 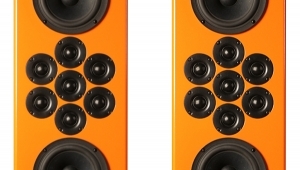 The Kii Audio Three is an outstanding loudspeaker. However, it took a bit of getting used toin addition to visual bias, under all but the most ideal situations each of us is adapted to the effect of his or her room on the sound. While I was struck by the transparency of the Kii Threes' soundstaging and transparency, freed as they are from most acoustical influences, the result was somewhat surreal. I found myself groping for explanations that apply more to conventional speakers: What happened to the warmth? Isn't it a bit bright? Is there a midrange suckout? Are the rear-mounted drivers spraying sound out the back to be washed back at me from the front wall? There was none of that. The Kii Three didn't just lift a veil away from the musicit removed a heavy cloak.